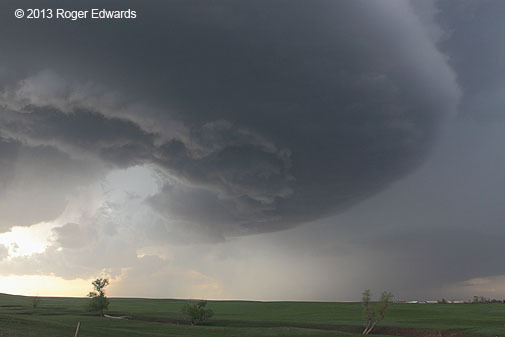 SHORT: Long drive Roundup-BIS-MBG, supercell becoming outflow-dominant near SD-ND border. * Busting along the boundary near BIS would put us an extra 3 hours out of the way for the following day and save more than a tank of fuel. Yet, somehow we were feeling adventurous with the more conditional advantages, including greater moisture and potential boundary augmentation to low-level shear and SRH–not to mention that cutting SE toward RAP would guarantee we’d see no storms. 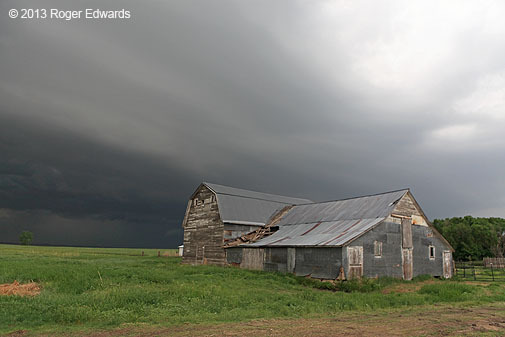 These are the quandaries commonly faced by storm observers roaming the Great Plains every spring! 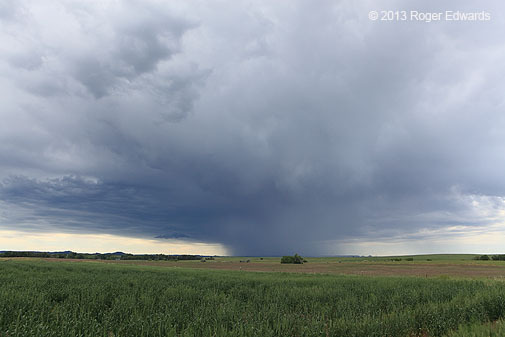 Had we cut SE on a relaxing, between-chase-day drive to Belle Fourche or RAP, I would have had little regret, given that the storm ultimately was a big mess. Still, one doesn’t necessarily know storm-scale details 5 hours out. In the end, we had some good times and good photos around that storm, so no regrets over the decision to roll into the Peace Garden State. 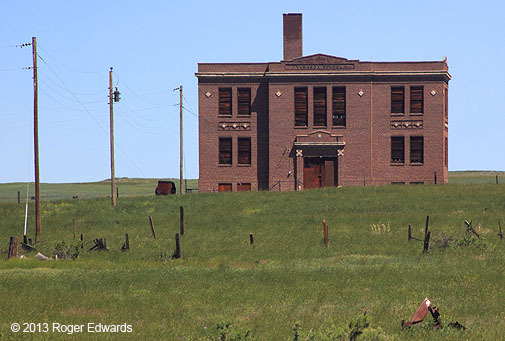 Driving from Roundup to Forsyth (along I-94) is a sobering experience–beautiful northern High Plains countryside, but also a “Big Empty” with little along the way save a few ranches and the mostly abandoned townsite of Vananda (old homestead and schoolhouse, now on private property). There are few cars or people, almost no reliable cellular telephone service, and little reassurance of any assistance should an emergency come to pass. One must be self-reliant, confident, and most of all, prepared. Fortunately, we were, and no dire situations arose. We hit Forsyth and cruised up to MLS for a final decision on whether or not to attempt a storm intercept that day. Lunch in MLS put food in tummies and insight in brains regarding the strong outflow boundary from the previous nights’ MCS that was retreating NE across MT and parts of western and southern ND. The mild cold front that gave us such a splendid and dry commute to MLS intersected the outflow boundary in the MT/ND border region, but stronger low-level lift and moisture each were forecast farther ESE and SE along the boundary in ND. How far? It was hard to tell, but a visually evident string of towers to the distant ENE-ESE helped us to decide to take a chance on a storm. The trip toward BIS on I-94 seemed to take hours…and it did! That was a whopper of a drive. Passing DIK, we learned of a storm rapidly forming SE of BIS. Stopping at a rest area between DIK-BIS, we re-evaluated the scenario. Thinking the storm might be too far away, with no evidence of closer development along the boundary and the sun angle getting low, we considered bailing S into SD W of BIS. * There would be enough daylight to reach it with about an hour to spare. And so we went, fueling in BIS with gasoline for car and chocolate-mint milkshake for driver, then heading E and S down US-83 toward Linton ND. The storm backbuilt, discretely propagating down a flanking line across the highway ahead of us, but we encountered only rain, a few close CGs, and strong gusts while squeezing ourselves between two cores. Popping out the south side of the activity near the ND/SD border, it was apparent that the formerly robust supercell was now something else: a quasi-linear slab of updrafts that would get undercut fairly quickly by outflow from the larger cluster of storms that had grown upscale from the original convection (looking W across a glacial lake). We barely stayed ahead of the outflow while navigating a one-lane, pilot-car regulated construction zone just over the SD border. 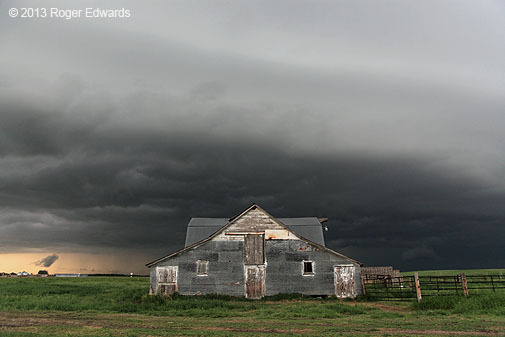 After passing Mound City, we found an old barn to use as foreground for the shelf cloud. Of several shots taken there, this was my favorite. Meanwhile the owner, a local farmer, regaled us with tales of the history of the place, including the original barn’s late-1800s construction by homesteaders, and the additions in the mid-1900s. The creaky edifice was riddled with holes and leaks, and he was going to take a bulldozer to it the next day–if the storm didn’t push it down first. Ironically, he also had just returned from LWT recently, but for the purpose of buying and hauling back a choice bull for his herd. 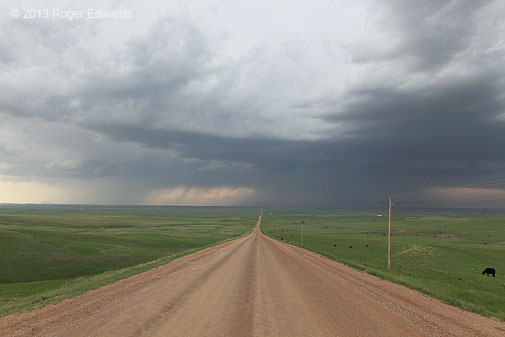 As long as nothing meteorologically urgent is compelling departure (and it wasn’t), conversations with rural folks on the Plains have been some of the most interesting parts of these travels for me. Though a big-city native, I’ve always had a deep, strong, alternatively conscious and subconscious tug toward the country, probably due to the farm upbringing of my dad and long-ago stories thereabouts. Those helped to imbue in me a deep respect and appreciation for the honest, authentic, hard-working, self-reliant, diligent, steadfast, frugal, faithful and neighborly values of the Middle American farmer and rancher. Such interactions always reinforce that sense of honor. 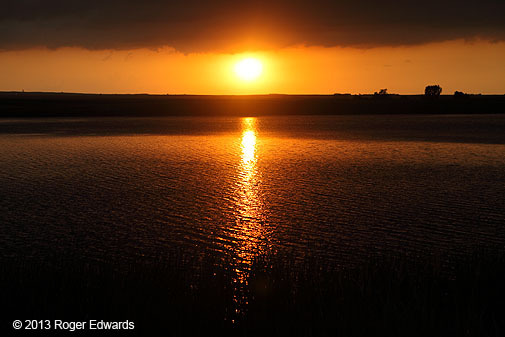 Outflow hit, and we parted ways with the South Dakota farmer to get back ahead of the weakening density current and watch the sunset across another glacial lake. While I was almost too fixated to the WNW, Elke brought my attention to a subtle but splendid scene of beauty unfolding in the opposite sky. 2) that some combination of lake gatherings, family reunions and a fishing tournament had filled all rooms but an upstairs one at one motel we didn’t particularly like–the Mobridge Kountry Inn (obviously a recycled 1980s-vintage Super-8). When I told her the reason for our later-than-forecast arrival, the east-Indian proprietor at the motel was quite eager to badmouth the “horrible, lazy American kids” and their service at the Burger King. She acted like she hated living there. Granted, while the inexcusable untimeliness of the “horrible American kids” at that Burger King certainly didn’t exemplify the work ethic of the nearby farmers, her attitude also was bothersome. Storm-observing vacations always are an adventure. In the morning, we both had bites in places a mosquito couldn’t have attacked. Though we took the beds and sheets completely apart and found no bedbugs, we suspected them. More on the next day in the upcoming story for…the next day! 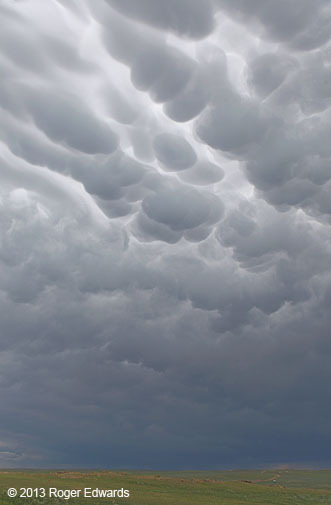 SHORT: Early elevated storm CDR, back-of-MCS mammatus show eastern WY. BANG! That was how our day started, as a very close lightning strike awoke us from slumber in our motel room. Elevated storms had been rumbling overhead for some time during the early daylight period, their rain pattering a stay-asleep-please lullaby outside; but that vicious blast on the trailing side of it all was a literal eye-opener. [During a later visit to CDR, we found out from the motel proprietors that the strike split a tree in half about a block from there.] I PINGed the rain, of course. Anticipating that any storm potential on this day would be roughly on the way between CDR and our intended destination of Buffalo WY, Elke and I started the day with a short driving tour of CDR that we have been wanting to do for years, then saw another long-desired destination there: the Mari Sandoz High Plains Heritage Center at Chadron State College. Though small, the museum was well worthwhile–a great tribute to the life of the High Plains pioneer writer and documentation of the hardscrabble life she and her parents led in settling the Sandhills. Leaving the museum, we saw the sun peek out but also heard distant rumblings to the W. A small, elevated thunderstorm was riding the top of the outflow pool from the morning convection. While Elke gathered some supplies at Wal-Mart, I found a nearby hilltop from which to enjoy the view. 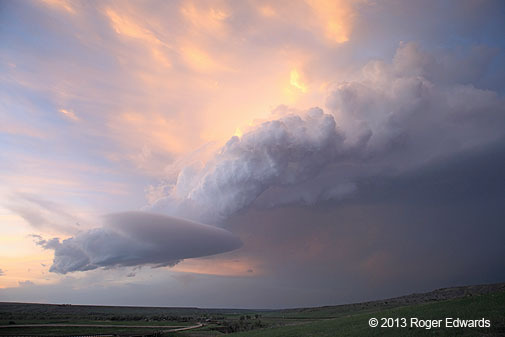 The verdant prairies of a Nebraska Panhandle springtime can make even an ordinary, elevated storm seem majestic and beautiful! We ate lunch from that hillside Country Kitchen with the grand SW view, then hit the road NW into the SW corner of SD. 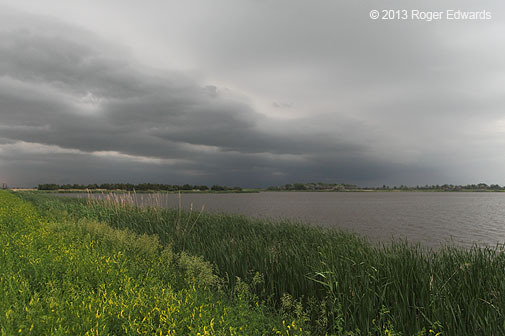 …we had good cause to expect seeing a storm at some point this day. We planned to dabble in whatever convective pleasures the atmosphere offered, then settle into Buffalo for the night with a trip through the Bighorns planned day-2 and some Montana chasing on the docket day-3. Only a few days out of Norman, our Oklahoma home nonetheless seemed so far away and long ago as we trekked across the grand vistas of the northern High Plains and around the SW rim of the Black Hills. 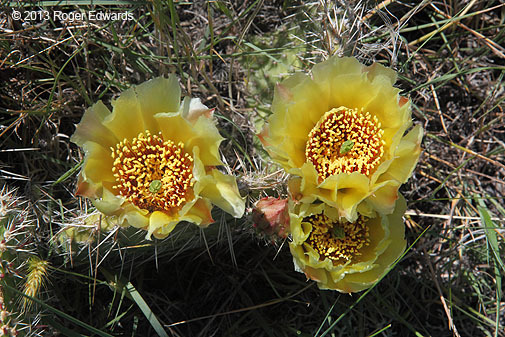 Visiting the adjoining Ogallala (NEb) and Buffalo Gap (SD) National Grasslands for a spell, we did some short hikes over the wide-open Plains, dodging flowering cacti while watching persistent but non-deepening high-based convective towers to our SW, over WY and along the boundary. In the distance, convection built over the Black Hills and small, fuzzy anvils started to spread off the eastern slopes of the Bighorns. We zigzagged the mixture of paved and unpaved roads characteristic of southwestern Fall River County, skirting just close enough to the Black Hills convection to see that it was rather high-based, poorly organized, incipiently outflow-dominant and unlikely to survive in any chase-worthy form after peeling out of the hills. Meanwhile, the persistent towers to our SW stayed about the same height they had been for two hours, and the anvils got enticingly dark and thick to our W. A check of radar during a brief data-availability interlude, however, revealed a very messy multicell-supercell clustered structure that was starting to accelerate SSE across WY and surf its own outflow. Rather than make a mad run 100 or more miles to our S to get ahead of the charging convective mess, while adding 4-6 hours to the journey to get near or past CYS (and well out of our way) then back up, we decided to take a more leisurely approach. We remained on the planned westerly track, let the growing convective mass gather its cold pool and pass off to our SW, then slip in behind its bowing forces of rampage and see what storm light would greet us. This choice didn’t disappoint! 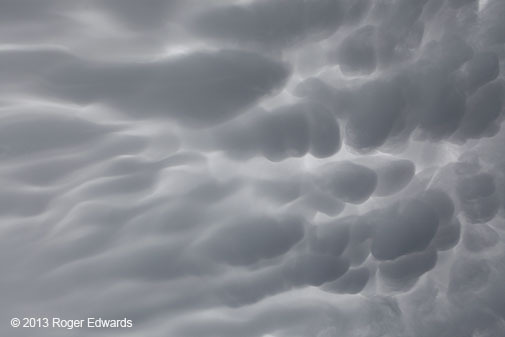 Appropriately named on this day, the Thunder Basin National Grassland hosted a spectacular display of mammatus (looking overhead at first, then toward the S). 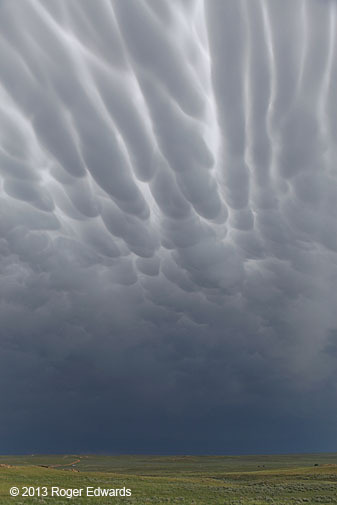 The amazing mammatus field evolved into sinuous forms resembling pods of swimming marine mammals (view with landscape foreground), as it moved fairly rapidly southward across the open rangeland apace with the parent MCS that, by this time, was blasting parts of SE WY with no mercy whatsoever. We stood in cool outflow air, thoroughly immersed in the resplendent scene passing off toward the southern horizon, until sunshine came out and limited contrast. 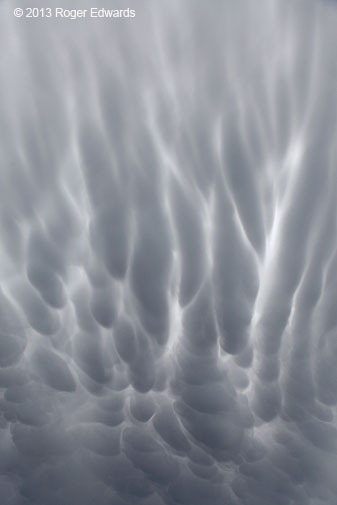 Once the convection and mammatus departed, so did we, shuffling off to Buffalo–Wyoming that is, via Gillette and I-90. A fine dinner in town and a day in the Bighorns area lay ahead. Our PING trail for this day. 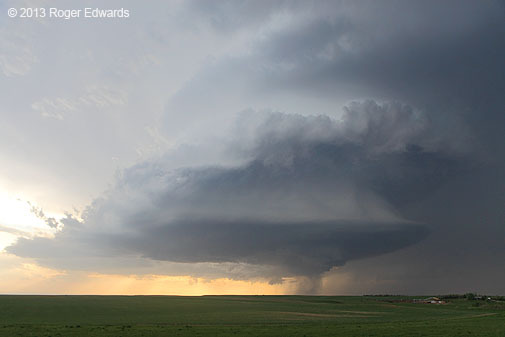 SHORT: After a long wait for storms to form further S, intercepted absolutely spectacular late-day and sunset supercell N through E of Rapid City. No alarm went off, but somehow, despite a long travel and chase day before, I snapped awake at the unusual hour of 10 a.m. CDT (9 a.m. MDT), looked at some diagnostics and forecast information, chose a preliminary target between CDR and the Black Hills, and headed up to OGA for breakfast and more data perusal at the Denny’s free wi-fi. That’s about the only Denny’s I’ll patronize anymore; it’s one of the very few that’s clean, friendly and spacious, with good hot food and good wi-fi. 2. I wouldn’t have to go under the dash and pull a fuse (that also powered other things) every night or disconnect the battery to prevent that very outcome. Both the owner’s manual’s fuse guide and online fora for my vehicle were vaguely worded on [i]which specific fuse to pull, of course, making it potentially a trial-and-error ordeal. Still, this was a bothersome problem, especially for night driving. The fix (bad switch buried inside the door) was too time- and tool-intensive for where I was and what I had, and would have to wait until getting back home. Fortunately I hardly noticed the continually running light by day. This will matter later. 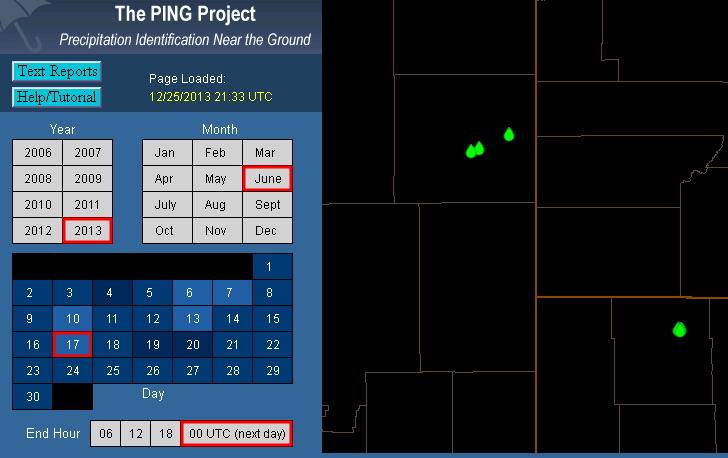 Meanwhile, as the chase crew with whom I was to meet later headed N through KS, I browsed data and maps, determining three targets–one in central NEb, near the S rim of the Sandhills, along an old outflow-reinforced warm front. With a strong cap and convergence along the boundary likely to weaken through the day, huge CAPE but marginal shear, I ruled out that high bust-risk situation for more sure but more moisture-deprived initiation farther N. The dryline near the S side of the Black Hills looked interesting, on the N edge of a narrow moist plume, but could have cap problems. Backed upslope flow in the northern Black Hills region and western SD also looked promising, but more distant, considering the next day’s potential back in Nebraska. North to CDR it was. 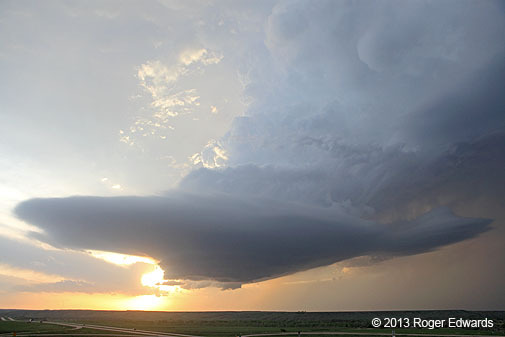 While watching the dryline towers bubble up and down in CDR, I was met by the amazing chase crew of David Fogel, Samara Fogel, Keith Brown, Ross Weitzberg, and massive doofus leonbergers Porthos and Trego, who drove up from a chase the day before in NWTX. Yes, that’s four persons and two person-sized dogs, all in one SUV. Somehow they make it work well, occasionally intolerable bouts of canine flatulence notwithstanding. 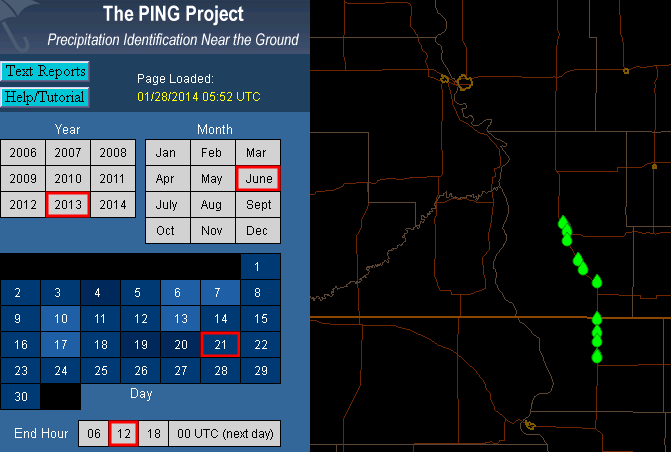 Seeing the towers gradually get less impressive with time, while we baked in the sun and storms fired “way up” in west-central SD NNW of RAP, was discouraging. The anvil looked like it was a million miles away, barely above the horizon, and we didn’t relish the prospect of that being the only show. Then the storms consolidated into a remarkably well-“armed” supercell, with a hook echo shaped much like a flexed bicep, forearm and fist. Enough of this…our southern target area was turning into a smelly atmospheric turd. This left no other option but to sit and sulk, or zip almost two hours northward to and around the eastern Black Hills, in hopes something would be left of the SD storm before sunset. Presumptuousness of that sort was premature and unwarranted! 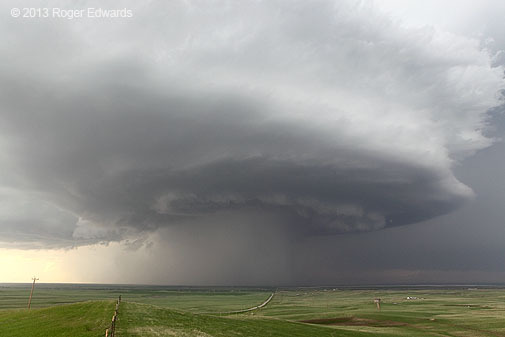 We actually caught this storm in a down cycle, following a major core dump. Driving in a big loop north then east of the base and Box Elder, we caught up to and passed under the south rim of the storm (mostly dry RFD area). In doing so, it assumed much more classical, banded cloud forms. 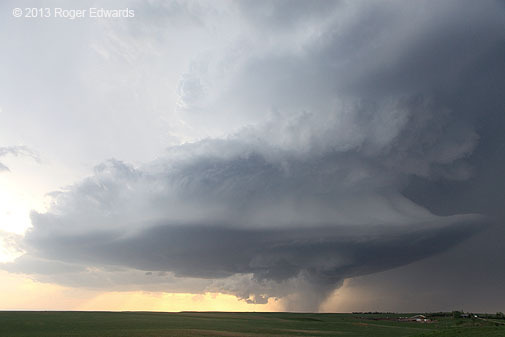 We got ahead of the supercell and let it come to us at three locations, as it put on a structural feast for the ages. Please enjoy. 1. [i]5 NE Box Elder SD: High-based wedding cake with a dense central core. 2. 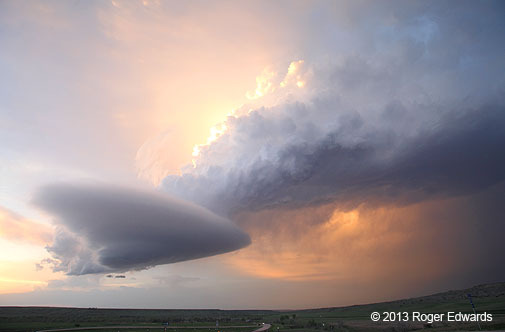 [i]5 NW Wasta SD: Helical convective spiral atop a flared bell whose base grew outward and more laminar. This was a dream come true–therapeutic to the max–the sort of experience that makes the trek from Norman to western South Dakota well worthwhile! 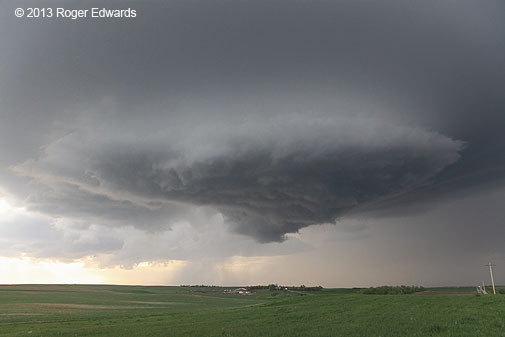 We spent a long time at this stop and let the storm come to us, since some tighter cloud-base rotation became apparent from a flared, triangular wall cloud–the last such attempt before the boundary layer cooled enough to deny suitably unstable inflow. 3. [i]1 E Wasta SD: A sunset extraordinaire! 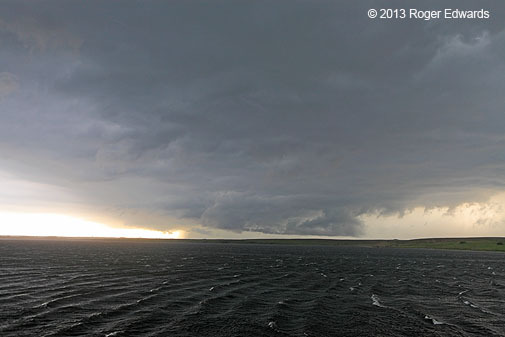 The storm’s main updraft, which had been moving SE, turned back E again–a sure sign it was losing surface inflow and coming more under the influence of winds aloft. This most gorgeous of “chicken necked” updrafts gradually became more stretched and narrow amidst a sublime blend of warm and cool light tones. Both the storm and daylight faded away, sending us on the road back to CDR for the night, since the next day’s potential looked to be in central Nebraska. Though the storm wasn’t tornadic, we celebrated our amazing fortune of the day with a good dinner among friends at Texas Roadhouse in RAP. 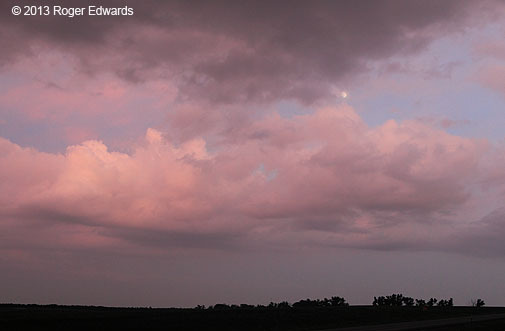 For an hour, the drive back from dinner was another mesmerizing Great Plains experience. A full moon rose over the foothills of the Black Hills, its gentle silver light reflecting off east-facing slopes to the right and silhouetting those to the left. 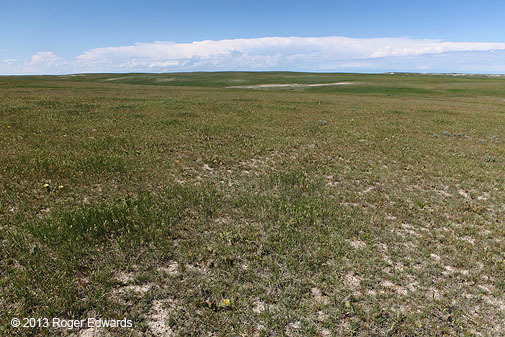 Moonlight bright enough to reveal the green carpet of the rolling grasslands also outlined the edges of the nearby eastern hills in the shimmering fuzz of short-grass prairie, reminiscent of the silver lining of silhouetted clouds. Shadows from the hills to the left curved across the road and over muscular terrain on the west side, lending amazing texture and light form to the landscape–especially for nighttime. That I could see this past the dome light was a testament to how bright the moon was; and I did cup my right hand over the light on straightaways to absorb the experience more fully. These scenes wave through my mind with yesterday’s clarity three months later, sure to stay for a lifetime. Red and blue lights appeared in the rear-view mirror, flashing brightly. The scene had been a little too mesmerizing, as it turns out. Even though I was following the other crew, and we all were driving somewhat above the speed limit, I was the one pulled over. The running dome light (and a roof light I didn’t know was out) arose suspicion based on a profile. Fortunately the trooper simply wrote a warning–the speed overage wasn’t excessive, he wasn’t out for ticket quotas, and he was satisfied with my honesty about both the lights and why I was there. He seemed relieved that I wasn’t some drug runner–specifically mentioning the presence of several lately, often with malfunctioning lights. We actually had a nice chat about storm spotting, severe weather in South Dakota, and our mutual experiences driving Crown Vics in hail. Our lodging for the night was the Westerner in CDR–locally owned and staffed, highly recommended for both low price and welcoming service! They accommodated the enormous Fogel dogs and even David himself, which was quite remarkable. 🙂 Impressed by their friendliness and rates, Elke and I would return to the Westerner twice on our trip in June. Meanwhile, I got some duct tape from Ross and covered up that blasted light.